One of the most dreaded experiences for military families is permanent change of station (PCS) season. No matter how senior or junior you are, this invariably strikes service members every one to three years and is a massive undertaking that requires saying goodbye to friends you have made, finding a place to live at the new duty station, identifying schools for kids, potentially new jobs for spouses, and the list goes on! I organized a 10-rule model (learned the hard way early in my career) that often had us all the way moved in to include pictures on walls and no boxes strewn about the house in about 72 hours. Whether you use these rules verbatim, or have variations on the themes below, I can assure you it will help relieve stress, make the move easier on you and your family, and reduce distractions as you are invariably tackling a new role and challenge in your professional career. Rule 1: Organize your stuff the way you want it unpacked on the other side. Movers approach packing your house room-by-room and label the boxes the same way (kitchen, children bedroom No. 1 etc.). In nearly every circumstance, the new house will NOT be a near match to the one you are departing, so you should organize your house functionally. For me, this meant aggregating lamps, consolidating all electronics into a single area, taking all the art and pictures off of walls and stacking them in the same corner. This is clearly extra work on the front end, but will allow you to find things on the other side in an organized manner, which is critically important to getting moved into the new house efficiently. Rule 2: Deliberately set aside all the items you need for the first two to three weeks when the majority of your possessions will be inaccessible. Anyone who has PCS’d has found themselves in the circumstance where something they needed got packed. This routinely happens because we procrastinate and set those items aside haphazardly and at the last minute after we get children to sleep and the movers are arriving the next morning. First and foremost, set aside the types of things that are must-have items. This could be medicine, baby/toddler food and safety devices, pet cages and leashes etc. You should also set aside the things that you are not comfortable with having movers put in boxes. I routinely brought my computers, family photo albums (mostly digital these days), weapons, and things that I considered irreplaceable. Finally, pack away the things you know you will need: toiletries, electronic device chargers, favorite kid toys, clothes for the trip and put ALL of this in a well-marked place that is labeled “do not move.” Executing Rule 1 well should allow you to free up a closet to put these do-not-pack items. Once they are there, label it and check throughout the packout to ensure the movers were compliant. Rule 3: Let the purge begin. I don’t know why, but I have observed tons of military families hesitate to get rid of stuff they haven’t used in years. One of the rules of thumb my wife and I employed was if we hadn’t touched it in the past year (and it wasn’t a seasonal item like scuba stuff, snow gear, or sports equipment) we should strongly consider getting rid of it. The likelihood that you will continue to not use it is high, which means it just takes up room on the other side when space will invariably be at a premium as you settle into your new house. Rule 4: Visualize how your stuff fits into the new house. When the new house is empty it is essential that you visualize how your stuff will fit into it. 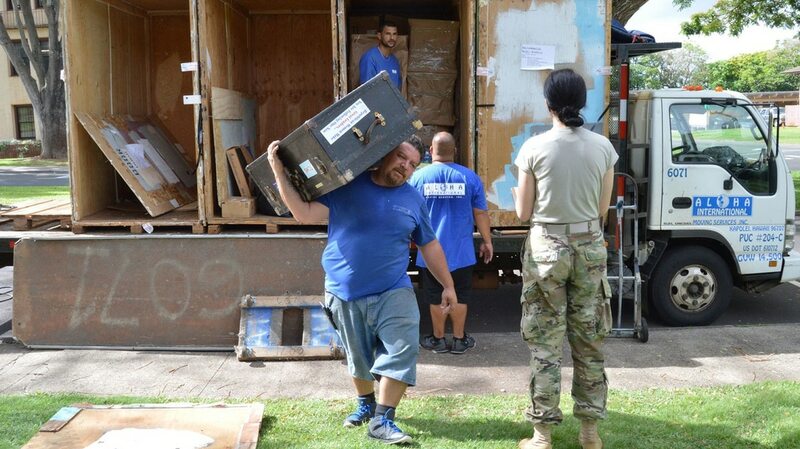 The reason this is so important is because once the moving truck starts disgorging your stuff, the movers will move it once, and then it is on you if you want it changed. Therefore, lack of a plan means it that in addition to the challenges of getting the family resettled; you can add finding a new chiropractor to the list! Wherever possible, this visualization step is best done when you are still in the old house. For example, it was not uncommon that an outdoor table or a kid’s playset simply couldn’t fit at the new location. Under those circumstances, I’d default to step 3 so it reduced the distractions on the other end. Rule 5: All the cardboard goes out with the movers. This is far and away the most arduous step of this process. Most military move contracts stipulate that they are required to unbox your stuff and put it on a flat surface. They would prefer not to do this because it is incredibly time consuming, and they often don’t make a point of starting that process unless prompted to do so. More often than not, we simply just want the movers out of the house because it is late, kids need to be fed, pets need to be walked, and if you just sign the paperwork acknowledging all your stuff has arrived, you can make this annoyance go away. This is not the approach I recommend. Rule 5 requires two sets of hands to execute properly. One of you needs to be at the door signing off on the boxes as they enter the house and directing furniture and items based on what you determined in Rule 4. The other member has a box cutter and is slashing boxes open like their lives depended on it. My approach was to try and match movers with boxes coming in, and give them the opportunity to carry the now empty boxes back out on their way to grab the next load. This does a couple things, first it reduces the amount of debris that will be under foot while you are trying to organize the house; and second, it forces you to deal with the problem of finding a home for all this stuff and not ignore it in a box for months on end. The only exception I have to the no-cardboard rule is book boxes. I have a ton of books, and keeping them in the box makes it easier to eventually get them on the right bookshelves located in multiple places throughout the new house. Rule 6: One room at a time and stay on target. As stated in Rule 5, unboxing everything is a forcing function to do something about it. I usually was laser focused on one room at a time. I traditionally started in the kitchen, migrated to the bathrooms, and then got my daughter’s room situated. This deliberate approach helped me from getting distracted with the surrounding chaos and incrementally chip away at the problem in a way that I didn’t have to constantly backtrack. Rule 7: Give yourself one room, closet, or corner for the stuff you are just not sure about. Despite your best attempts to visualize where stuff should go, there will be stuff that comes out of a box, and you will be flummoxed as to what to do with it. If you find yourself in that position, immediately stick it in your “not sure” room, closet, or corner and keep attacking the stuff you do know what to do with. You will find that as the house starts to take shape, you will slowly work through the “not sure pile,” and eventually the remainder is likely best suited for Goodwill or storage. Rule 8: Plan on a Goodwill run and start your pile immediately. It doesn’t matter how well you plan on the front end, you will realize there was stuff you missed on the first purge that needs to get donated or items simply won’t work in the new house configuration. Be decisive, stick it in the Goodwill pile that is out of the way and not underfoot, and keep attacking the problem. Rule 9: Get pets and kids out of the house, if possible. I know this is easier said than done, but if you are able to get kids to a friend’s house, daycare or camp, and the pets to a local animal daycare, you should do it. This action will buy you time at a very critical juncture. It is also particularly important if your pets are escape artists or your children are at an age where it isn’t safe for them, due to lack of kid proofing in the new house. Rule 10: It’s just stuff. When your stuff gets packed up, moved hundreds or thousands of miles, occasionally gets put in a warehouse (i.e. taken off a truck, then put back on a truck), then eventually delivered and unpacked at the new destination, it is a miracle that MORE stuff isn’t broken during the PCS process. It is inevitable that items you cherish will be broken or damaged. At the end of the day, it’s just stuff and lingering over it will just distract you from the immense pile of items that still require tending to. There will be a time and a place to address the items that are broken, but I have found that is best done a few days later and after the house is in a good state of order. I hope you found these tips useful and best of luck in your next PCS! Matt Reiley is a retired Marine Corps officer who served from 1991 to 2017.